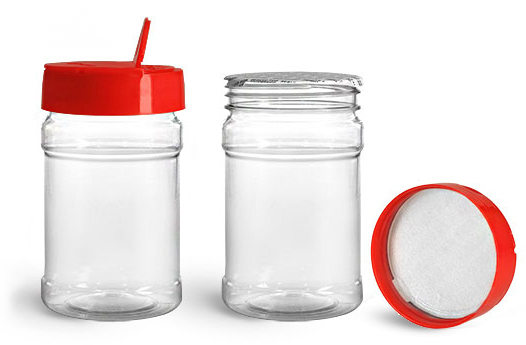 Clear PET plastic jars with red spice caps could be used to house and dispense products like spices, dry rubs, and seasoning blends. Red polypropylene spice caps offer both a pouring and sifting dispensing option. One side features a large opening for easy pouring, while the other has six holes, 0.2" in diameter, for sifting. These vibrant red spice caps include PS113 liners with the words "Sealed for Freshness" printed, and adhere to the clear jars when secured in place.